So wouldn't switching it to SD mean it's a SiDe III? Yeah, I have the same issue around here. Even the cheap USB thumb drives are 32GB now. will be SIDE3 thing iam waiting for? ATR support through the cartridge port is always sub-par IMHO. SIO2SD, SDrive, SIO2PC, etc.. are always superior. Cartridge emulation and SIO emulation could be combined, but that would require an extra cable to the SIO port. It seems most Atarians do not like that (as far as I read on AA). There's a C64 cartridge (1541 Ultimate II+) that does exactly that (connects to the IEC serial port), which is extremely versatile. Edited by ivop, Wed Nov 1, 2017 1:34 PM. ATR support with a cartridge is best achieved with corresponding internal mods, of course, which is how U1MB/SIDE does it. 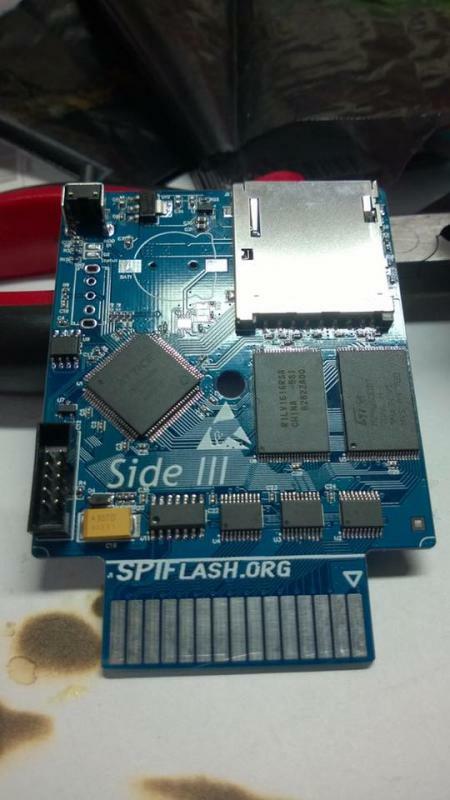 But unless SIDE 3's SPI controller completely emulates an IDE controller, it won't work with the U1MB PBI driver... and I have no idea, since no-one told me anything. Thats why I am using both the Ultimate cartridge and SIO2SD. Edited by CharlieChaplin, Wed Nov 1, 2017 2:31 PM. Bit concerned with hearing that fjc has no involvement in this. His BIOS for Incognito and Ultimate1MB, as well as the SIDE loader far surpassed the originals in look and functionality. SDX is not needed for this functionality, but yes you need a SpartaDos formatted partition to store the ATR files on. Mounting can be done through the IDE+ menu (only to D1:) or in SDX (to more drive numbers, multiple ATR's). I wrote a tiny tool (not spread yet, I need to make it userfriendly) that saves the settings of the mounted ATR's in a very tiny binary file. Handy. When you fire this saved binary file (from MyPicoDos or whatever dos you prefer) the previously stored settings of mounted ATR's is restored and your ATARI boots the ATR's. I have a lot of these tiny XEX files now: Goonies, summergames, Johny's Trouble, ECKN+ etc. for all the disk games, stored on my MyPicoDos game partition. As soon as I want to play Goonies or Summergames, I simply load that tiny file, the IDE+ mounts the right ATR's and there it goes. Can't agree more. FJC has proven to be the best BIOS creator in the entire scene. His creations are far superior, and I am really excited about all the extra functionality he achieved. I would love to see a BIOS for IDE+ from his hand. That would be gooooooooood. This is the last mention of it I've seen. I'd love to see this in 2018, preferably the first half. Does anyone have any news you can share on this? It's been quite a while since the announcement. I am also waiting for the SIDE3. Some years ago, i almost bought the SIDE2. but just waited. Then , last year, the SIDE3 was announced. Using SD cards. I hope it will be for sale soon. I'll then buy the SIDE3. (if it also has Spartados). Edited by Stormtrooper of Death, Wed May 2, 2018 6:24 AM. Nearly bought a SIDE II but am waiting for this. I have a MIST to do some fast loading. Really hope to hear about an update. I'd like to know if the Side 3 is still planned, as well. Candle's been scarce on the forum the last year or so according to his profile. Edited by Nezgar, Fri Jun 15, 2018 10:09 AM. They work, especially if you use the firmware update that I haven't released yet. But yes: they're very stable in SIDE2. I can vouch for this. I use one of these interchangeably in my SIDE2 and MyIDE2. No news about the SIDE 3 since 23th july in this topic. Is there any news/updates about progress about the SIDE 3 ? If I have an Ultimate Cart and a 1088XEL with an XEL-CF in it, is there anything the SiDE2/3 offers that I don't already have? Not really. SIDE3 is a completely unknown quantity at the moment and the XEL-CF is functionally equivalent to SIDE2 in the context of the hard disk. I kind of doubt it. I am interested in seeing what the SiDE3 is going to offer but I already have an Ultimate Cart, a UNO, a SIO2SD, and a SDRIVE-MAX. It's hard to conceive that the SiDE3 will be able to offer much that I cannot already do. I just realised I can load atr files from the XEL-CF! Yeah, I don't think there is much I would need a SiDE3 for.